You can see the tab represented as the hex number 09 on the second line. Observe that there seem to be two spaces between the dots on the first line, but only one space between the dots on the second line. However, I'd expect there two be two spaces between the dots on the second line too: one for the tab, and one for the carriage-return at the end of the line. This implies that the tab character is never seen by the TeX engine's "stomach", which explains the typeset outcome. TeX deletes any <space> characters (number 32) that occur at the right end of an input line. Note the specification of the number 32, which is ASCII space. Trailing blanks are removed from the line; thus, either last=first (in which case the line was entirely blank) or buffer[last − 1]≠"␣". So why is there only a single space between the dots on the second typeset line? the distances between the two dots on both lines are the same, however, as Steven B. Segletes' experiment shows, the tab is not seen by the engine's "stomach". Some code findings for the "folklore" of egreg's answer. TeX removes "blanks" at the end of an input line. This is done at a very early stage, just after reading the line before considering category codes and the input characters get tokenized. Originally, these "blanks" are spaces only, but TeX distributions like TeX Live or MiKTeX extends them to include tabulators (horizontal tabulator). The snippets show the behavior for TeX, and pdfTeX. Not shown are XeTeX and LuaTeX that also remove spaces and tabulators at the end of input lines. The code snippets come from TeX Live (2016). The original TeX only removes spaces at the end of an input line. However, the Pascal version of input_ln will be overwritten by a more efficient C version, see the next code snippets. @x [3.31] l.933 - Do `input_ln' in C.
isblank tests for space and tabulators, therefore both are removed at the end of an input line. The change is very old, two decades ago in the last century. 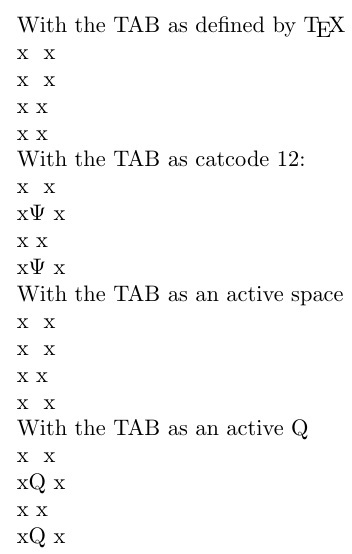 Only the <tab> followed by % survives, because TeX Live implementations of TeX remove trailing spaces and tabs from lines, irrespective of their catcodes. I tried to find the reference, but apparently this is to be considered folklore. The space between the first two periods is added by the end-of-line. I discovered that even though I was copy and pasting a TAB into TeXworks, the editor itself was doing a conversion to spaces in my ORIGINAL ANSWER. 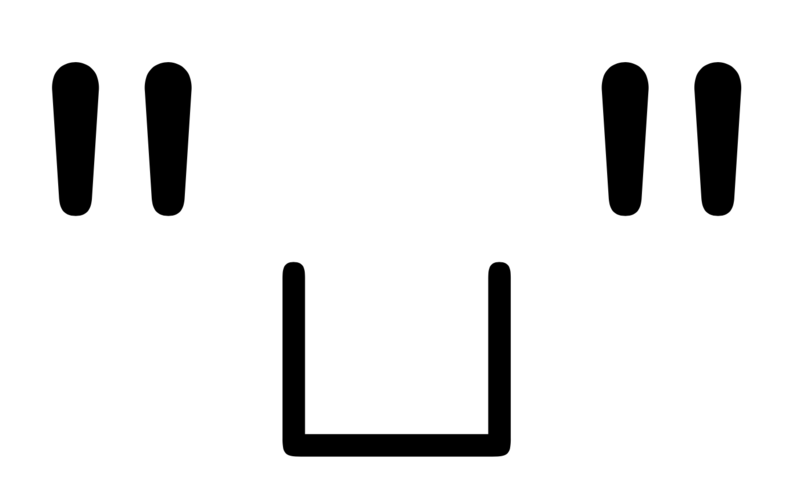 Thus, I used a different editor which I knew would preserve the TAB character in the file, and it shows that the keyboard TAB behaves like the ^^I "TeX TAB"...almost. If the TAB is not at the line end, then the "keyboard-TAB" and "TeX-TAB" behave identically. 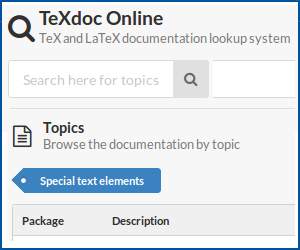 If however, the TAB is at the end-of-line, the "keyboard TAB" is treated as a space, whereas the "TeX TAB" is still treated however redefined by TeX. Keyboard TABS and TeX-TABs (^^I) seem to be treated the same, except at the end of input lines. Keyboard TABS are removed at the end-of-line (what David said), whereas ^^I TABS are not. Use the TeX TAB ^^I to denote TABS in code, as editors are prone to do auto-conversion on your keyboard TABS otherwise. The original answer was removed, because I was fooled by my editor when pasting a TAB into the input file...the editor did an auto-conversion to spaces. I should note the TeXbook talks about the TAB character, as noted in my comments to the OP, on pages 8, 45, 369-370, and 391. But file handling is one of the few system-dependent tex features, and web2c based TeX also strip tab. how TeX treats punctuation, specifically the . I know your ultimate question is only about the first one, so let's get the other things out of the way first. Note that the .s behave differently from the a-b example except in the cases with explicit spaces (.\ . and .\ \ .). However, these differences are just because TeX typesets a larger space after sentences for typographic reasons (and all these differences go away if you add \frenchspacing), so we might as well work with just simple letters to avoid that confusion. Conclusion: Trailing tabs are removed when reading a line. Now your remaining question is why this is so, and whether this is consistent with Knuth's intentions as stated in either The TeXbook or the TeX program (aka Volume A and Volume B). In section 31 of the TeX program is the input_ln procedure which reads in lines. He says “trailing blanks are removed”. 00000048: 6f 64 65 31 34 3d 31 32 0a 5c 63 61 74 63 6f 64 65 31 32 37 3d 31 32 0a  ode14=12.\catcode127=12. 00000060: 61 00 0a 62 0a 0a 61 01 0a 62 0a 0a 61 02 0a 62 0a 0a 61 03 0a 62 0a 0a  a..b..a..b..a..b..a..b..
00000078: 61 04 0a 62 0a 0a 61 05 0a 62 0a 0a 61 06 0a 62 0a 0a 61 07 0a 62 0a 0a  a..b..a..b..a..b..a..b..
00000090: 61 08 0a 62 0a 0a 61 09 0a 62 0a 0a 61 0b 0a 62 0a 0a 61 0c 0a 62 0a 0a  a..b..a..b..a..b..a..b..
000000a8: 61 0d 0a 62 0a 0a 61 0e 0a 62 0a 0a 61 0f 0a 62 0a 0a 61 10 0a 62 0a 0a  a..b..a..b..a..b..a..b..
000000c0: 61 11 0a 62 0a 0a 61 12 0a 62 0a 0a 61 13 0a 62 0a 0a 61 14 0a 62 0a 0a  a..b..a..b..a..b..a..b..
000000d8: 61 15 0a 62 0a 0a 61 16 0a 62 0a 0a 61 17 0a 62 0a 0a 61 18 0a 62 0a 0a  a..b..a..b..a..b..a..b..
000000f0: 61 19 0a 62 0a 0a 61 1a 0a 62 0a 0a 61 1b 0a 62 0a 0a 61 1c 0a 62 0a 0a  a..b..a..b..a..b..a..b..
00000108: 61 1d 0a 62 0a 0a 61 1e 0a 62 0a 0a 61 1f 0a 62 0a 0a 61 7f 0a 62 0a 0a  a..b..a..b..a..b..a..b..
00000120: 5c 65 6e 64 0a                                                           \end. The behavior has been confirmed as a bug by David Fuchs, and TeX Live's Karl Berry has told me it would be fixed in web2c. Julian Gilbey traced the bug to the same source as Heiko Oberdiek did in his answer. Here's what Mr. Fuchs had to say about this bug.
! Text line contains an invalid character.l.3 .^^? But module 23 is very explicit on the proper way to "get the most permissive character set", which every port typically does, and it's in that context that the claim of "correct behavior" above is made. Finally, one might wonder why TeX strips trailing spaces and nothing else, including tabs. The answer is that originally it didn't strip anything. But there were systems we wanted to support (particularly IBM's OS360 and VM/CMS) that had fixed-record conventions for text files. So, typically, moving a .tex file to an IBM mainframe caused each line to be padded out to 80 characters by the system adding trailing space characters. We wanted to make sure that any round-trip to/from such systems would not create an input file that had any chance of a mysterious change of behavior between platforms (in, say, some verbatim mode), and the best solution was to have TeX always ignore trailing space characters, so that it would be immune to them automagically appearing. But there was no reason to strip any other characters, including tab. Not the answer you're looking for? Browse other questions tagged spacing tex-core or ask your own question. Does the tab key do anything? Which TeX procedure removes trailing tabs? How to write a two-pass system in TeX? Why do we need \ldots? Character bytes and character tokens: If newlines are converted to spaces, then where does catcode 5 come into the picture?